Alexandra Bracken’s Young Reader Adaptation of A New Hope Looks Really Good And You Should Read It! Last week, StarWars.com revealed the official covers of the OT adaptations written by Alexandra Bracken, Adam Gidwitz, and Tom Angleburger. The reveal was accompanied by a sampler excerpting the three books. There was some negative play on some sites and on the TFN Literature forum, partly because these are young reader adaptations instead of full novelizations and partly because of the stylistic choices the authors made in their adaptations. I made a thread at TFN Lit advising folks to actually read the sampler before rushing to judgment based on some out of context quotes and/or assumptions that young reader books wouldn’t be any good. The three OT adaptations are very different because the authors were presumably given the liberty to adapt the story for young readers in the way they saw fit. I may write about the ESB and ROTJ adaptations at a future date, but today I’m going to write about Bracken’s ANH adaptation because I think it’s the most promising in the set and its three chapters in the sampler illustrate why folks shouldn’t dismiss a book just because it’s for young readers. I never read much YR Lit (Percy Jackson/Olympus books excepted, because hey, it’s me) but Star Wars YR is on fire right now. I’ve already delivered high praise for Jason Fry’s two Servants of the Empire books, need to track down Michael Kogge’s well-regarded books, and have high hopes for genre experimentation with the upcoming Lost Stars by Claudia Gray. Alexandra Bracken’s The Princess, the Scoundrel, and the Farm Boy is written for the same age range (8-12) as Fry and Kogge’s books and judging from the sampler, it looks like it’ll be just as good as those. As indicated by its title, The Princess, the Scoundrel, and the Farm Boy is about the Big Three. Bracken chose to tell the story of the original Star Wars movie through the point of view of each character in turn, and Leia features in the opening section of the book (and consequently, the three sample chapters). At risk of gushing, I have to say that it’s probably already my favorite Leia portrayal in a Star Wars book. The fact that this book is for young readers is of no moment – the characterization is superb, the writing is impressive, and the storytelling is imaginative. Bracken isn’t merely retelling a story we already told, she is genuinely expanding it with material sourced from the radio drama or the old EU, but also with entirely new scenes. Readers who skip this book because it’s for young readers are going to miss a great opportunity to understand more about the film. Can we talk about how cool Leia is? I have a confession to make: before TIE Fighter turned me into the arch-Imperial that I am known for being, Leia was my favorite Star Wars character. That’s right, I was once… a Rebel (!). Though I’m slightly concerned at the teasing I’ll get at this admission, it’s of no moment compared to the teasing I got as an elementary school-aged boy when I declared Leia was my favorite Star Wars character. She’s always been near and dear to me, and I am pleased as punch that she’s getting some justice to her character. She is part of the Big Three, and so often I see her overshadowed by Han and Luke. Leia-centric material is few and far between – a few journals and short stories, some comics, some novels with major Leia plot lines, even the bizarre but cool non-canon TFU2 scenario where Leia is the Jedi Knight trying to win the Battle of Endor. The Princess, the Smuggler, and the Farm Boy is another one of those stories. Leia shares the story with Luke and Han, but she gets the cover and first billing – it’s about time. Without Leia, Luke and Han would’ve never become the heroes they had – Star Wars is her story too. Basically, I think this book is really promising because of the way Bracken completely nails Leia. It’s perfect – capturing Leia’s sense of energy, determination, grit, and even frustration. Bracken’s Leia feels very authentic to the cinematic Leia of A New Hope: she’s the fiery senator who is passionate about her cause, and the tight third person POV even captures Leia’s sharp tongue too. This is the most I’ve enjoyed an author’s portrayal of Leia since Martha Wells’ excellent Razor’s Edge. It’s a good read for all audiences and I definitely imagine adult readers might feel transported back to a time when they were first touched by the magic of the original Star Wars film. So let’s dig into The Princess, the Scoundrel, and the Farm Boy. 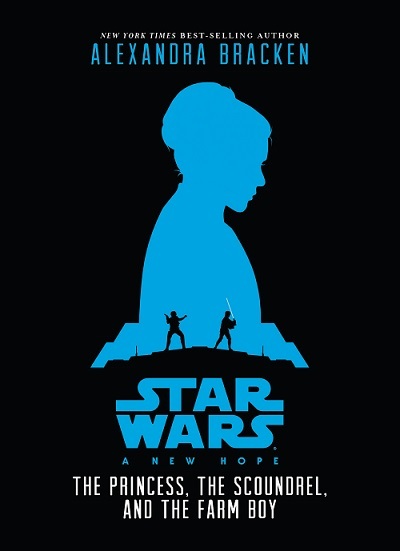 I love everything about this one – from the cover (despite the understandable choice of the cover designer using the more striking profile of ESB Leia than the ANH hairbuns) to the writing style. The introduction alone grabbed my interest in the way that it captured the mythic tones that are my deepest associations with Star Wars: it resembles the introduction to the Alan Dean Foster ANH novelization as well as the “A Brief History of the Old Republic” piece from the Technical Journal of the Imperial Forces (probably not an intentional reference to the latter, but I like that kind of “fond loftiness” for beginning this kind of larger-than-life adventure). The style shifts once the book actually begins, where the narrative gets into the heads of each of the big three characters in turn: Leia, Han, and Luke. The released excerpt only covers Leia’s POV, but if Bracken writes the rest of the characters even half as well as she handles Leia, this’ll be one of my favorite Star Wars novels out there (adult novels included). My favorite parts of the excerpt were Leia’s memories of her time in the Imperial Senate. I’ve long maintained that I think that Leia can easily carry her own stories, and that I’d like at least some of them to be political/diplomatic stories (not seen since late Bantam: Black Fleet Crisis came closest but she was out of character, and The New Rebellion was just weird). She’s a wonderful action heroine – nobody should doubt that – but politics is her wheelhouse too, and it’s where she can do what few others can. Even Mon Mothma respected Leia’s idealism and passion in the old EU. Bracken bears this out: her Leia is the lone voice of dissent against the overwhelming apathy (if not collusion or collaboration) of the Senate to Imperial atrocities. Her passion and brilliance are wonderful to behold, and on the note of brilliance: the reaction Leia has to her father’s description of her as a shining star is too good to spoil here. Leia’s responses to injustice and lack of political will to make change strongly remind me of other favorite Leia portrayals, most notably First Impressions from Star Wars Tales (track the issue down and read it!). Her formal presentation to the Emperor is hilarious in her POV but also captures the terror envisioned in the old comic panels. Leia’s memories of her aunts’ etiquette lessons and snobbery are my other favorite bit of this portrayal (great echoes from Children of the Jedi and The Princess Leia Diaries, the latter also from SW Tales) as Leia’s resentment of those lessons and her ability to switch from passionate troublemaker to regal princess in a moment is an important part of Leia’s characterization and I’m glad it’s survived from the EU. I should note that despite how near and dear the EU is to my heart, it’s not the EU references themselves that are important but how well they’re used and how well they serve the story: here, they are perfect for Leia’s portrayal. An excerpt that sells the rest of the book… and maybe more too! The Princess, The Scoundrel, and the Farm Boy would be notable for its characterization of Leia alone (and I expect similarly insightful treatment of Han and Luke, Han’s struggle with self-preservation versus his inbuilt decency he can’t get rid of or Luke’s transformation from a forelorn/earnest kid to a bonafide hero) but in its opening chapters, the book also expands the story of A New Hope beyond film/EU elements. There are some original scenes that I won’t spoil, but they’re fun and I’m hoping we see more of what Leia is up to before she’s rescued in ANH. I think we’ll come to see that Leia wasn’t just sitting idly by waiting for a hero: that’s not the Leia we know and love, and that’s not the Leia we’ll see here. Who knows what sides of Han and Luke we might discover, as well? I certainly know that I’ll be eager to find out, and I hope I’ve convinced a few others to take a stab at this and other young reader books as well. I’ve spent a lot of time writing about a three chapter segment of an unreleased book, but as you can see from my gushing I kind of loved it. I’d love to see more of the same from Alexandra Bracken – if you’re reading this Disney-Lucasfilm Press (or heck, Del Rey! ), give her more books to write, especially Leia-centric politics/diplomacy books. This article is coming out on my birthday and it’d be a nice treat for me if I got my wish! The Princess, the Smuggler, and the Farm Boy comes out September 22nd. Comments Off on Alexandra Bracken’s Young Reader Adaptation of A New Hope Looks Really Good And You Should Read It!